Walking the trail in Segovia. Photo: james McConnell. 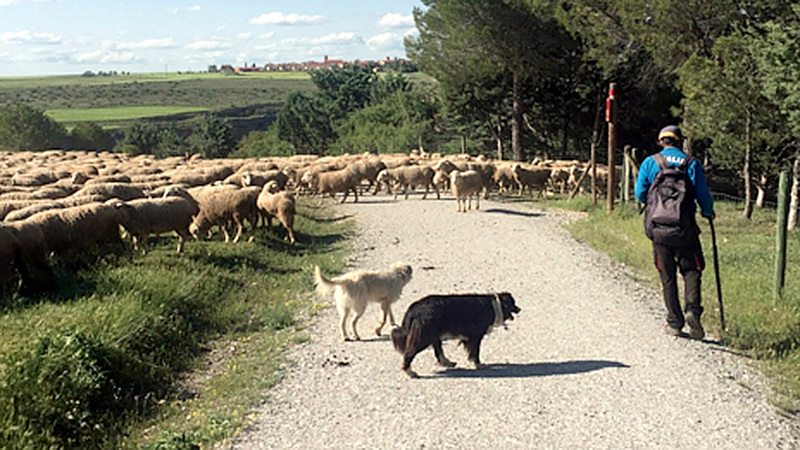 A typical Sunday in Segovia is a little different than a typical Sunday on NC State’s campus. Today, we woke up around 9am and decided to go for a run. Since we are still learning our way around the city, we ventured into “el campo” to find a new path. El campo is the outskirt area of the city; full of green grass, pretty flowers, and a beautiful outside view of the Alcazar and Cathedral. The authors ready for the trail. Photo: James McConnell. Halfway through our excursion, we heard a ringing noise coming from the valley below us. Matt and Caroline immediately began to follow this noise, leading them down the steep mountain. Although being a little hesitant at first we couldn’t let them explore alone and miss out on this experience! After following the noises for a few minutes, we heard what we soon realized was a hundred sheep scaling the mountain. We followed the noises for about 30 minutes before we saw the full herd. Now this was a real adventure! When we turned around, we noticed we had traveled very far from our original path, but luckily we found another path up above us that looked familiar. We reached the top of the mountain and the pack of at least a hundred sheep were standing right in front of us. When we got a little closer, we noticed a shepherd and two sheep herding dogs. This was by far the best Sunday so far. We ended up following them a little more, for the selfie opportunity (of course) before we turned around. Looking back at this day, we are so lucky for these endless adventures and the beautiful countryside of Segovia. I think we will make this a weekly adventure from now on!